Institute of Demolition Engineers dedicates regional meeting to “Mr Liebherr”. 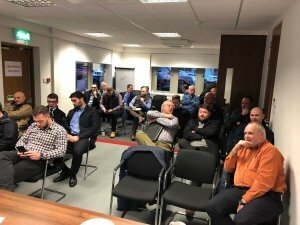 The first IDE Midlands Region meeting of 2019 took place earlier this week at the headquarters of Armac Group, and the meeting was dedicated to the memory of Liebherr’s Darren Bennet who had been a huge and loyal supporter of the IDE. More than 30 delegates were treated to excellent presentations by John Woodward FIDE, Adrian McLean FIDE and Danny Kearney who were joined delegates from Molson Finlay attending their first IDE meeting. The evening started with a presentation from John Woodward entitled: “Asbestos – it bloody hides everywhere!” which included images of unusual asbestos finds on demolition projects including correctly bagged asbestos found beneath a school stage, and asbestos used in mortar in brick and stone walls. The images prompted good comment from the floor and the consensus from the room at the end of the meeting was that the images from the presentation would make a good industry toolbox talk if widely distributed. The next speaker was Danny Kearney of Prosafe Consultants who has worked in the demolition industry for many years as health and safety advisor to Lee Demolition and many others. Kearney has recently qualified as an approved trainer for Mental Health First Aid and is launching, in conjunction with C&D Consultancy, Mental Health First Aid courses for the demolition industry from February 2019. Kearney’s presentation “Demolishing Mental Health Barriers” was a brief but telling overview of the massive numbers of people in the construction and demolition industries who are affected by mental health issues and was certainly an eye- opener for many in the room as to how high those figures are and – in particular – the tragically high number of people who take their own lives every year. The final presentation of the evening was from Armac’s Adrian Mclean FIDE and addressed the correct way to call for the demolition industry to publish a guidance note for lift removal. McLean suggests that the knowledge of the older demolition engineers would be lost to future generations unless we take the time now to document their knowledge in a format that allows education in the future. The evening then closed with lively discussion about training needs in the industry and the current CCDO card scheme with John Woodward reminding the delegates that the current DRO card does not allow the holder to undertake structural demolition work. The next Midlands Regional Meeting will be hosted by AR Demolition in the East Midlands on Wednesday 8 May 2019 at a venue to be agreed. Posted: February 1st, 2019 under General.